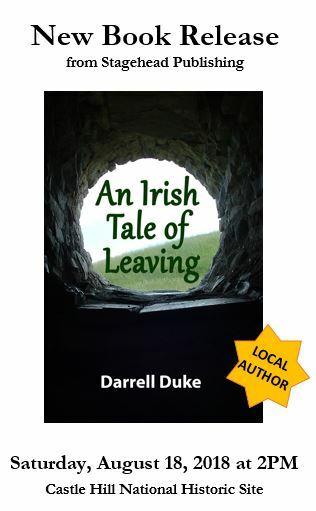 Castle Hill National Historic Site/Parks Canada, Jerseyside, Placentia Bay, NL, will play host to the first launch of Darrell Duke’s new book, a historical-fiction novel entitled “An Irish Tale of Leaving” on Saturday, August 18, 2018, at 2 p.m. After signings, Duke will perform a min-concert of Irish ballads to honour the story’s primary setting, Ireland. Very excited about this one; a rare chance to play nothing but original tunes. I’ll be playing songs from my last two albums, as well as brand new stuff. For more information on Two Whales’ Coffee Shop, please visit http://www.twowhales.com. Darrell will be performing his requisite Eric Bogle war tunes, And the Band Played Waltzing Matilda and The Green Fields of France (Willie McBride), as well as other crowd favourites, at Castle Hill National Historic Park, Jerseyside, Placentia on Sunday afternoon, July 1st. Darrell will be performing Saturday, June 30th, 9 p.m. – Midnight at the Cabot Hi-way Cabins & RV Park on the outdoor stage, roughly halfway between Clarenville and Bonavista. Let’s hope summer weather (without the rain) arrives before then! In the event of rain (or snow), we’ll move it indoors. Wonderful people and the best of hospitality to be enjoyed!! Very excited about this one; a rare opportunity to perform nothing but original tunes. I’ll be playing material from my last two albums, as well as brand new songs. Set times to follow. Thanks. With the participation of Emma and Jessie Duke as illustrators, Stagehead is preparing its second book: a collection of children’s stories entitled “The Adventures of Crunch and Munch (Vol. 1).” Crunch and Munch, and their sister, Baby Jessie, are lobster siblings who live in a shed and, the same as most young humans, they are curious. Their interest in things big and small take them on many exciting and sometimes-frightening journeys, but in the end there’s always a lesson to learn. They deal with many of the same issues real children deal with and, with their friends, they work together to solve problems. Stand by for updates on Crunch and Munch and release dates of their stories in Volume 1. “An Irish Tale of Leaving” will soon be available to the public. Stagehead is in the process of setting up media interviews to promote the book, as well as finding suitable venues to host official launches. I recently started my own publishing company, Stagehead Publishing, and I’m excited to have an outlet to keep up with the many novels and books I’m working on. My soon-to-be-released novel, “An Irish Tale of Leaving,” has been in the works since 2012 and is a great story of my 4th Great Grandfather, his struggles in Ireland and his subsequent journeys to Newfoundland. Set in the late 1700s, it is full of romance, suspense and violence. I’m about to find my way back into doing interviews and marketing. It will be posted here on my site as to when the book will be available to the pubic, including official release dates and pertinent info. It will be available in both paperback and ebook versions. Thanks.